I opened my Etsy shop in June 2007, which I've operated continuously since then. Both my photography and my jewelry collections have developed considerably over the nine years I’ve been in business. My production line is simple, elegant, and joyful: I use oxidized sterling and fine silver, textured surfaces, semi-precious gemstones such as labradorite, peridot, and garnet, and steel-and-bronze sculptural elements as seen in the Tetrahedrons. My production pieces serve as an outlet for my compulsion to make things, adorning for the sake of adornment. 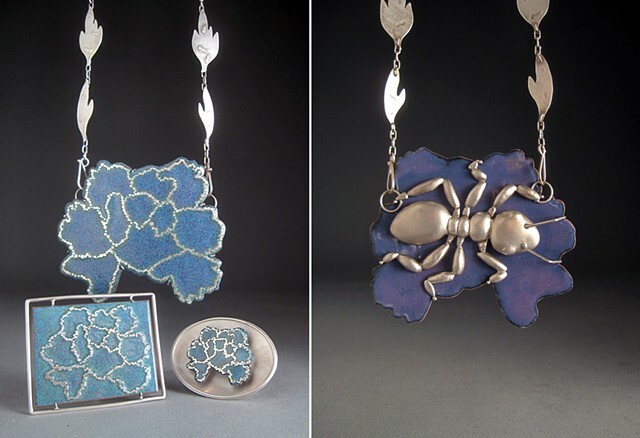 My art pieces are distinguished by my use of chasing-and-repoussé, enameling, chain-making, and sawing/piercing. While I work primarily in sterling silver, I don’t shy away from copper or brass when the particular piece needs a warmer touch. I sometimes use blatantly sexual imagery or use images as understated as abstracted flowers. The chasing-and-repoussé work I do is rooted in nature, simplified and broken down into segments, as in Pretty Pest. During my time at Central Washington University with Distinguished Professor Keith Lewis, I focused on working on a larger scale, learning new techniques, and how to infuse my work with more meaningful content. Keith was hugely helpful in this: every element of his own designs is imbued with meaning. Having grown up in the Pacific Northwest, surrounded by both abundant natural beauty, and the vast network of groundbreaking jewelry artists and galleries, my early artistic influences were Andy Cooperman, Ramona Solberg, and Kristi Zevenbergen. These artists have distinctive styles, but they all feature found objects or alternative materials in their artwork, which features prominent use in my larger art pieces. Early in my career, I aimed to show that what we perceive as shocking or inappropriate in reference to the female body is socially conditioned, and that that social conditioning is without purpose. In later pieces, I refined this theme further, specifically trying to contrast disgusting subjects with the beauty of the materials and methods used in their creation. The juxtaposition of beauty and ugliness is uncomfortable, unsettling, and enticing. Seeing Pretty Pest brings out childhood fears of insects nesting in your ears, or crawling on the back of your hand while digging in the dahlias. I’m looking for a visceral reaction from the viewer. By enlarging, simplifying and abstracting, I push the boundaries of reality, inviting the viewer to experience the disgusting - earwigs and ants - in a safe way. This contrast between the repulsive and the attractive is my attempt to describe my own experience navigating my body through the world. I find myself beautiful, and yet the society I live in tells me I’m disgusting, wrong, and unworthy. I aim to subvert the viewer into looking past the traditionally beautiful, to see the beauty in what people often find ugly.